Here’s a piece of advice. If you’re visiting North Wales, don’t miss Conwy, a historic walled town on the coast. Cute as a medieval button, this heritage town will surprise you with its wealth of attractions – at least it surprised me. To help you plan your trip here are the top things to do in Conwy. First you’ve got to get there. About two hours by train from either Manchester or Liverpool, or 90 minutes by car, it’s also only five miles from the popular seaside resort of Llandudno. Easy to get to, Conwy makes a great gateway for exploring the rugged wilds of Snowdonia and the stunning Welsh coast. 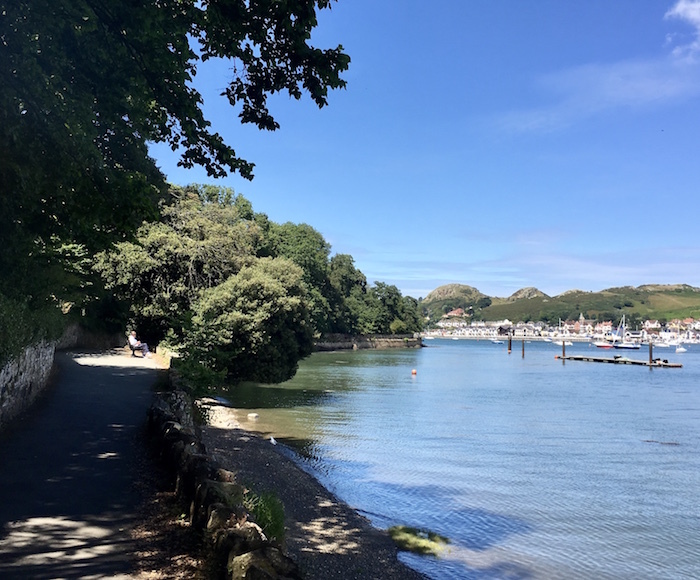 If you’re spending just one day in Conwy, you can fit most of these activities in, or I’d suggest at least visiting the castle, the attractions on High Street and the quay. There’s no avoiding the imposing 13th-century Conwy Castle – it looms over the walled town like an all-seeing overlord. 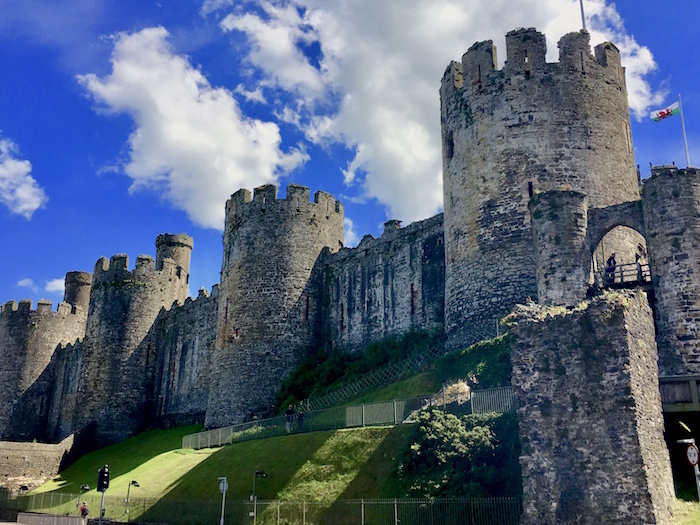 This formidable fortress is dripping with so much history I’ve written an entire Conwy Castle guide. Built by English-born Edward I during his conquest of Wales, it’s part of the famous Iron Ring of Castles constructed to subdue the unruly Welsh. (And who can blame their unruliness?) But history is history and today the castle is a UNESCO World Heritage Site and one of the top things to see in Conwy. 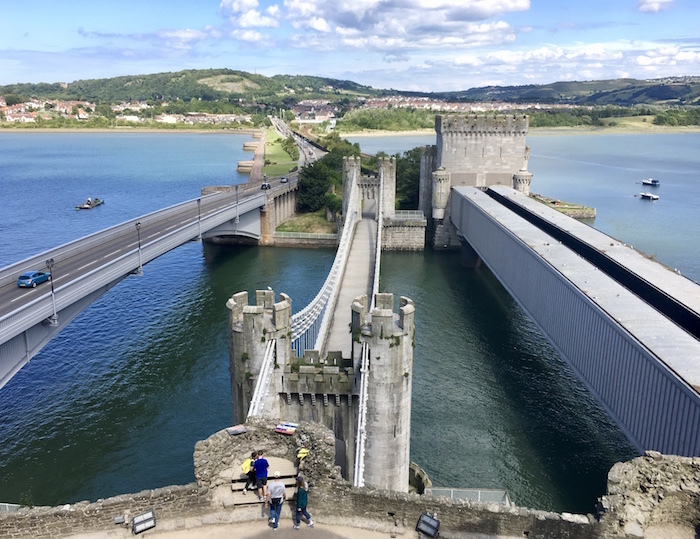 From one of the castle towers, you can get a bird’s eye view of the Conwy Suspension Bridge built by Thomas Telford in 1826. One of a trio of parallel bridges, it was one of the earliest road suspension bridges ever built and was designed to blend in with the medieval look of the castle. The bridge is pedestrian access only and its Toll House, a playhouse-sized mini fortress houses a small museum. If you’re visiting the castle anyway, picture English novelist Charlotte Bronte standing here with her new husband, Arthur Nicholls, the legate her father didn’t want her to marry. 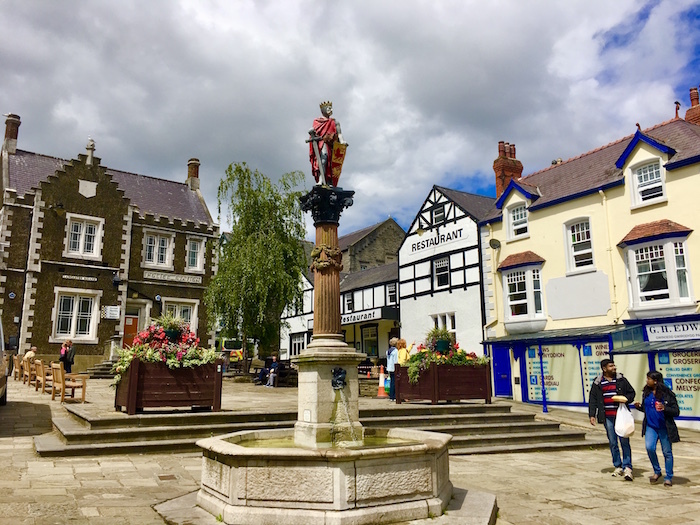 It was Charlotte’s first trip to Wales and the newlyweds chose to spend the first night of their honeymoon in Conwy before moving on to Bangor. Conwy Castle was the only tourist sight Charlotte and her husband stopped in to see. Were they overwhelmed by this once-mighty fortress? Was it gloomy enough to inspire any tragic tales on the scale of Jane Eyre? That’s what I wondered as I wandered through the inner ward, surrounded by the stout stone walls that had allowed Edward I to withstand a siege in 1294. Or was Charlotte secretly cheering for the Welsh, who managed to briefly take over the castle in a surprise attack in 1401? Maybe Charlotte was simply so happy and in love that all she thought of were the romantic views, a good Welsh dinner and newlywed bliss? I hope so. After a pleasant enough journey we have got safely to Conway; the evening is wet and wild, though the day was fair chiefly, with some gleams of sunshine. However, we are sheltered in a comfortable inn. That ‘comfortable inn’ was the Castle Hotel on the High Street, and by a happy coincidence I was staying at the same hotel. You couldn’t get a more atmospheric place to stay in Conwy. It’s one of those creaky wonderful places that can’t be replicated by any modern five-star palace no matter how grand. The hotel’s roots go back at least 500 years, but its current incarnation is a Victorian remake of a Jacobean manor. 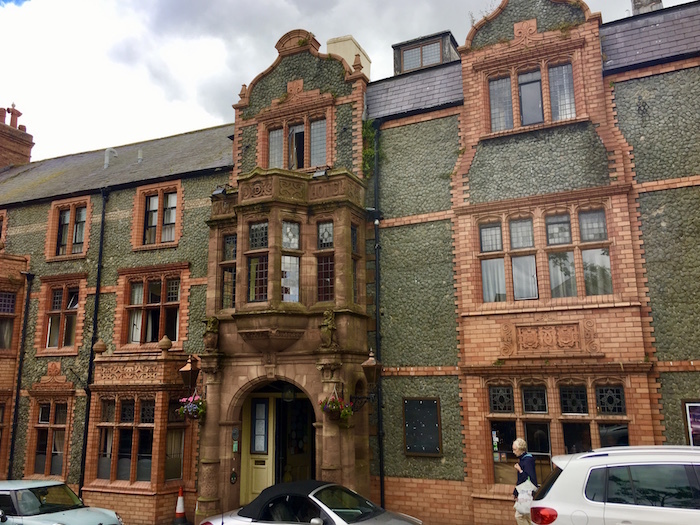 Sitting on the site of an ancient Cistercian abbey, with a prime location inside the city walls, the Castle Hotel Conwy is a mix of red brick, terracotta and limestone pieces with renaissance-looking bay windows that jut out over the street. Inside, the walls are lined with Victorian era paintings, wooden floors squeak and groan as if they’re trying to tell tales and the halls are filled with antique furniture and cushions with medieval-looking prints that look as if they should be dusty but aren’t. Even if you’re not staying here, you can stop in for a drink in one of the ground floor public rooms that seem to ramble down half the street, having taken over numerous pubs through the years. It also serves topnotch cuisine with a focus on locally-sourced ingredients, and I lingered happily over my full English Welsh breakfast, with gluten free sausages and grilled Portobello mushrooms the size of dark daisies. If you are in the Castle Hotel and tired of picturing Charlotte Bronte, you can think about William Wordsworth instead. He also stayed in the Castle Hotel on his honeymoon, which shows what a magnet it was for literary newlyweds. While Wordsworth was in Conwy he visited St. Mary’s Church. You can reach it by following a tiny lane beside the hotel. This is the main Wordsworth stop in Conwy, because after a chance meeting with an eight-year old girl in the church graveyard he was inspired to write the poem Nay Master, we are Seven about the girl and her six siblings, two of them who lay buried in the ground. St. Mary’s is even older than Conwy Castle. Its origins go back to 1190 when it was part of the Cistercian Aberconwy Abbey. Before Edward I swept in conquering things left and right, the abbey was an important religious centre and burial place for the independent Welsh princes of Gwynedd. After some persuasive arguments by Edward I (I wouldn’t have argued with him either), the abbey was moved upriver to Maenan and the church became the Parish Church of St. Mary’s and All Saints. If the church is open, you can go in to see a medieval processional cross, Pre-Raphaelite stained glass windows and an intricately-carved 15th-century rood screen. The big draw, however, is probably still the graveyard and the Wordsworth-inspired triangular wrought iron grave cover with seven small crosses and a plaque marked ‘We are Seven’. 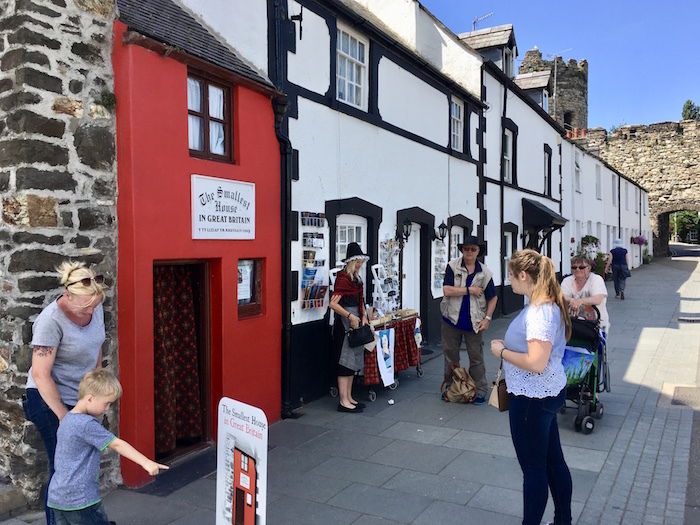 Retracing history is one of the most satisfying things to do in Conwy, mainly because the town reeks of it (in a good way). Another place to visit is Plas Mawr, a restored Elizabethan townhouse with colourful plasterwork, finely carved wood and a kitchen so real with game hanging from the rafters and vegetables on the table it looks as if the cook just stepped out to wring out a dishrag. But it’s more than a pretty face. What you’ll likely have gathered by now is that there was plenty of tension between the Welsh and the English, and, in fact, much of Edward’s expensive spending spree on castles and walls was to keep the Welsh out. After the walled town was completed only English settlers were allowed to live inside. That’s one reason Plas Mawr is special. It’s located inside the town walls but was owned by the town’s favourite aristocrat, a wealthy Welshman named Robert Wynn, who managed to stay in royal favour and lived here in the 1500s. 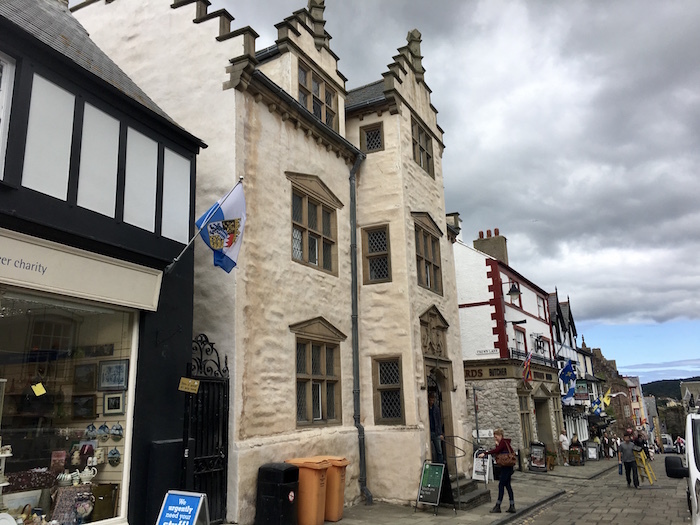 Still sitting proud on the High Street (everything in Conwy seems to be in walkable distance), and open to visitors, Plas Mawr is said to be the best preserved Elizabethan townhouse in Britain. 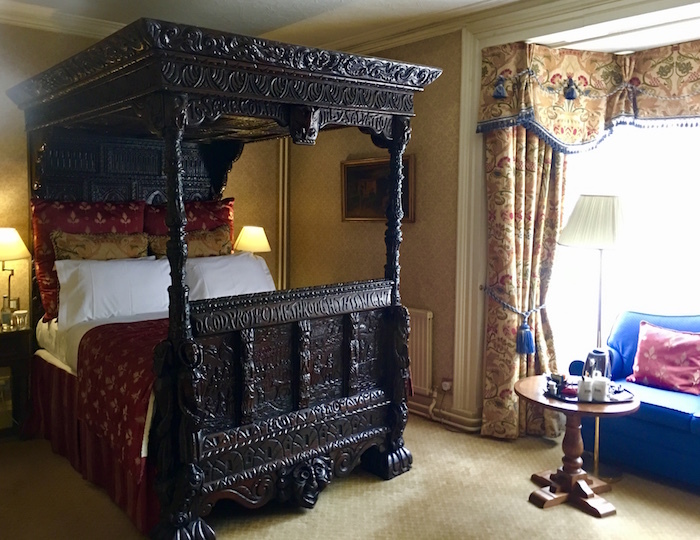 As an aside, Room 104 in the Castle Hotel has an Elizabethan bed (see picture above) that originally stood in Plas Mawr. It’s rumoured Charles I slept in it in 1625 when it belonged to the Wynn family. So I can’t say I saw any ghosts (and I did keep my eye out), but if you’re searching that would be a good place to start. Plas Mawr might be old, but it’s a youthful debutante compared to Aberconwy House, which was built in the 14th century. It’s the only medieval merchant’s house to have survived Conwy’s rocky past and it’s one of the oldest dwellings in all of Wales. Owned by English merchants (the Welsh weren’t allowed to live inside the town walls, remember? ), this stone and timber house with aged tilted floors sits on the corner of High Street and Castle Street. You can’t stay on the High Street forever, because one of Conwy’s top attractions is its quay. Worth a glance while you’re down there is the smallest house in Great Britain. As you can imagine, it’s a pretty short tour. The house is six feet wide, ten feet tall and was once home to a fisherman who was 6’3″. 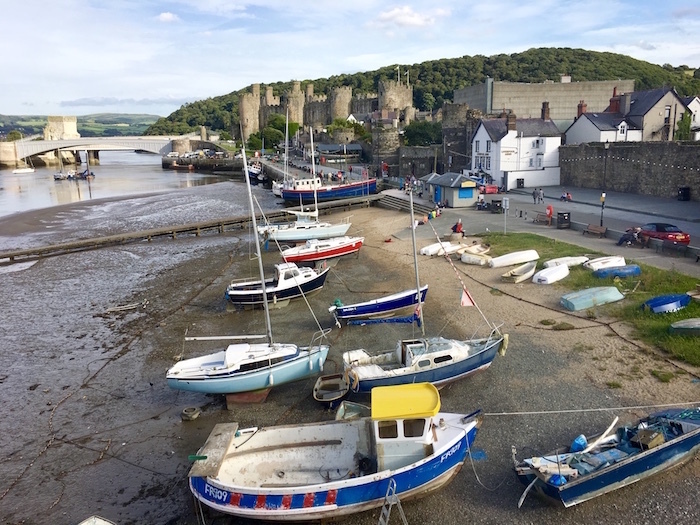 Conwy Quay has a relaxed holiday atmosphere and is perfect for strolling and breathing in some fresh coastal air. 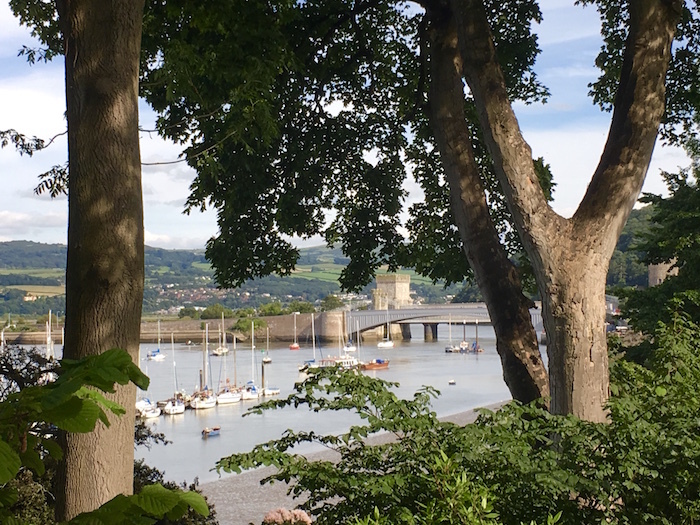 Buy some fresh steamed mussels for snacking on, look out over the Conwy Estuary with views to Deganwy or take a boat cruise for a waterfront view. By now you’ll likely need a drink so you might as well visit the Liverpool Arms, the oldest pub in Conwy. Since it’s right next to the tiniest house in Britain on the quay, you won’t have far to go. Bonus: It has the largest beer garden in Wales. To the west of Conwy Quay and the Marina is a lovely place for a wooded hike, Bodlondeb Woods. I stumbled across it by accident and liked it so much I went back three days in a row. There are plenty of forest paths, you can get views of the estuary and it feels as if it’s miles away from town, when really it’s just next door. If I’d had a car I would have hustled over to Bodnant Gardens as it’s a few miles away, so this is one of the top sights in Conwy I missed. Located at Tal-y-cafn, Colwyn Bay, Conwy, Bodnant Gardens is (from all reports) a flowery delight of terraces, Italian-style gardens, paths, ponds and waterfalls. The Bodnant Welsh Food Centre at the same location showcases the best of local Welsh products and cuisine. Clearly I missed out by not getting to try honey from the National Beekeeping Centre of Wales or having a Scorched trout, beetroot, avocado and yoghurt starter at the Hayloft Restaurant, but it doesn’t mean you have to miss out, too, so go and let me know how it was. 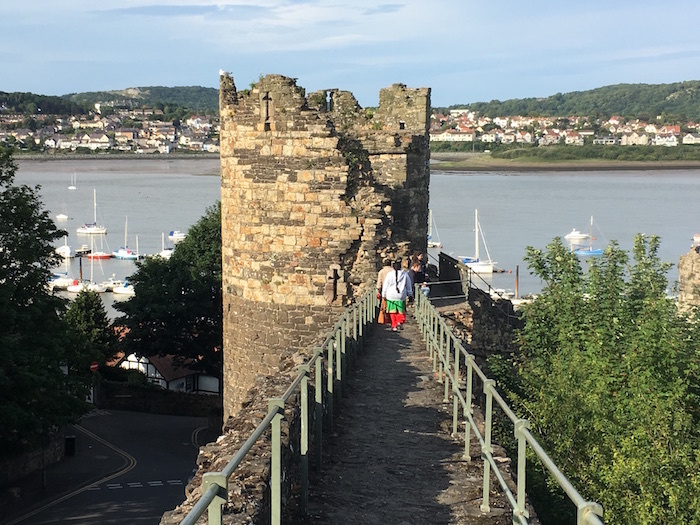 Considering Conwy is Britain’s most complete walled town, a great way to round off your stay is to do the town wall walk along the ancient ramparts. Of all the things to do in Conwy, this was probably my favourite activity, walking where guards with crossbows once stood on alert, but be forewarned, while you’re no longer likely to be shot with an arrow, the steps up are craggy and the drop off is steep. But what a view! With 21 towers, and three gateways, it’s a lofty, if slightly scary way of looking out over the history of Conwy and North Wales, of thinking of Edward I and Welsh princes, and of visitors such as Charlotte Bronte and Wordsworth and – just so you know – the Queen of Romania, who stopped in at the Castle Hotel for lunch in 1890 on her way to Llandudno. My stay at the Castle Hotel was arranged by Visit Britain, but as for searching out things to do in Conwy and places to see I was on my own. These were my highlights. For more travel info on Conwy visit VisitWales or VisitBritain. Hopefully, any literary footsteps in Conwy would be inspirational. I’m sure it would with you, Janice. Conwy looks delightful! But walking in the footsteps of Charlotte Bronte and William Wordsworth might give us writer’s block. Either that, or inspire us :-). I’m like you, ‘By Myself’ – I love to visit towns with literary history. Oh, thanks for the tip on Conwy, Jennifer. Parisella’s it is. Thanks, Julia. Conwy is one of my top choices for a place to visit in North Wales. I once read about this Conwy wall town in Wales. But I learned about it this blog and the conway wall town looks like a amazing place to visit. We loved Conwy! We just visited in August and went all around the bay. There are some impressive castles in Wales and Conwy Castle is definitely one of them. The smallest house is so cute. It’s incredible someone so tall actually lived in there. You also must get an ice cream at Parisella’s when in Conwy! I have never heard of Conwy but your descrition of the town and the castle makes me want to go there. What a nice discovery you have made between literary newlyweds and the Castle hotel :) :) During our recent visit to Warsaw , we saw the thinnest house. It was just 4 feet wide and 2 floors high. I see that you enjoyed some fine weather in Wales! Lucky lady indeed. :) That 13th century Conwy Castle is imposing to say the least. But I’m a sucker for old stone and medieval arrow slits. Love that you stumbled onto that pretty Bodlondeb Woods – love finding those hidden jewels in plain sight! This place looks very, very nice: Like built according to some victorian blueprint. It looks like all about the past – whether it’s the houses, the church or other structures. The Charlotte Bronte story brings a wonderful twist to it: I love to visit places where writers (or artists) used to live and love. Great place! I tried to bring in some history that isn’t in any usual ‘things to do in Conwy’ guide, Indrani. I thought the fact that Charlotte Bronte was there on her honeymoon was such a romantic piece of the past. Thank you. Conwy is truly an unsung attraction in Wales, Marlene. I felt the same way you did: why had I never heard about it? There’s no word on whether Conwy is truly haunted or not, Steph, but I’d be open to spending a night in the actual Conwy Castle to find out. Mind you, it would be pretty draughty! That’s exactly how I felt, Gab. Even if you only spend one day in Conwy, you can still get a sense of the history and fun things to do there. My room at the Castle Hotel wasn’t the one pictured, Paige, it was even better (other than the Elizabethan bed, which is one of a kind). 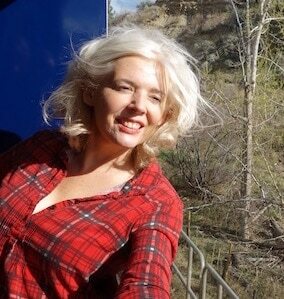 What I loved best was my window seat in a bay window that I could look out over the town at night. With a bit of mist I swirling about I could well imagine it through the centuries. Conwy looks absolutely lovely! They put together a beautiful trip for you. I’m very glad that you loved it! That suspension bridge looks really awesome! I love the vintage look of the hotel room. It’s really lovely! This walled town of Conwy sounds so interesting to me… actually reading about it for the first time. The connection with William Wordsmith has got me interested. And bed of Charles I and the stories of it being haunted… all of it makes it seem like worth exploring. Hope to make it there some day. Never heard about Conwy but it looks like an exceptional place, full of history. Loved all the tours you suggested and how cute is that little house?! Very peculiar! Thanks for showing this fantastic town and all the stories behind it. That is really one cute town! I love the Conwy Castle and the suspension bridge, and the Castle Hotel’s room with that vintage bed is so cool! I think I’ve crossed Conwy on our way to Llandudno, some 10 years back but I don’t remember because I was quite young and I was just sitting in the car, looking outside, not even knowing what was there. I would love to go back to Wales again one day. 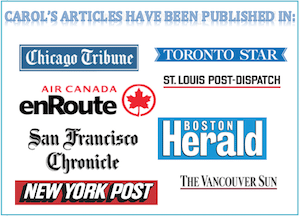 Wow Carol, you’ve shared so much to do here! Never been but hope to go someday. Would skip the haunted parts haha. But the Conwy Wall Walk sounds like a fun experience. Would love to see that tiny house too. Great post! A always love walled towns, Conwy certainly looks like one to put on my radar, thanks for the many tips!